Belden Cable Caddies are designed to be lightweight and durable to ensure years of trouble-free installations. They make cable storage and installation a breeze for installers. Heavy duty, lightweight steel tubing and unique folding mechanism allows for easy fold and transport of cable caddy. Tough, durable powder coated finish keeps cable caddy from weathering. Solid steel spool support bar withstands the weight of most large spools of cable up to 100 lbs. 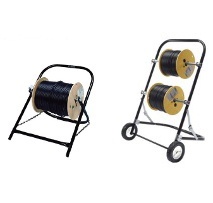 Variety of models to choose from to meet the needs of all cable installations.